Communion has changed since the moms of today participated. There are different rules that embrace modernity, but at the same time, the overall purpose and ceremony have stayed traditional. While planning your little girl’s communion is an exciting and special time, a few handy tips will help this memorable day go perfectly. It is a big day for your little and treating it as such will help her to remember it for years to come. We have some dos and don’ts of communing dressing. Hopefully, it will help you plan better starting with the most important thing what your angel should wear. As a religious event, the dress code that is respectful and conservative should be followed by all parties. Although conservative doesn’t mean boring, the 1st communion dress must be both elegant and respectful. On this big day, all children should be dressed the same. That’s why a white or ivory communion dress is a must for your little girl. It is nice to think back to the reason why the first communion dress is white. It is a symbol of purity and connecting with the start of your little girl’s journey with her faith. When picking out the dress for her first communion there are some common rules to follow to make life a little easier. First of all, pick an elegant, age-appropriate outfit. Preferably, stick to a white or light ivory colors. Although some may accept pink shades or colored sashes. Accessories and ornamentation on communion dresses should be minimal. At the same time, the first communion dress should have a simple cut, small sleeves and fall below the knee or be a calf length. 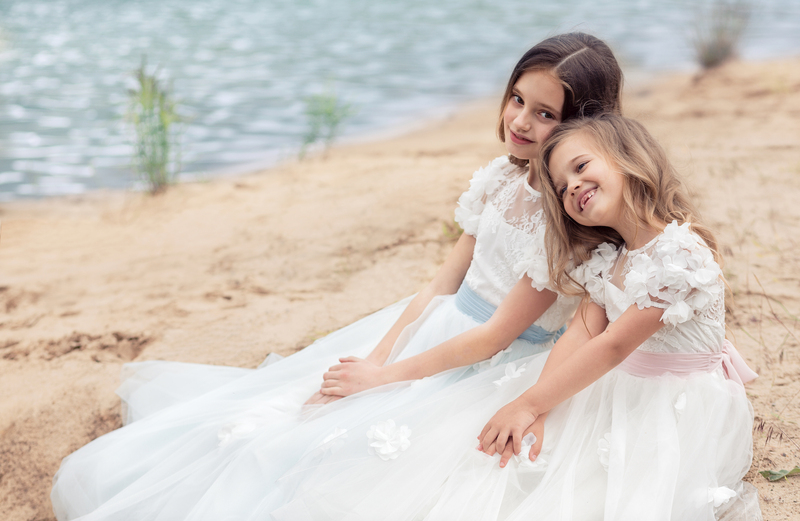 The first communion dress seems like the most important element of the day, but accessories are just as essential to complete your daughter’s look and prepare her for photos. Keeping with the elegant theme, a simple pair of white flats or dress shoes paired with a frilly pair of white socks is a perfect combo for any communion dress. If the special day is going to be a bit chilly, opt for a bolero jacket, sweater or fancy cardigan that your little girl can layer to keep warm. Having a veil or headpiece isn’t mandatory, but depending on your girl’s style and preferences a headband, tiara or flower wreath can make her feel like a real princess. And remember the overall style of communion is elegant and respectful and this should be followed from head to toe, starting with a gorgeous communion dress! Now that we have taken a look at the dos for communion dresses, let’s quickly run down what not to do. The main thing to remember is to stay away from dark or bright colors. Communion dresses shouldn’t be short or tight and shoulders should definitely be covered. The ceremony has a conservative tone, so dramatic embellishments like crystals or diamond headpieces are generally frowned upon. Another tip is to keep away from makeup. Although it may make her feel more grown up, her fresh face will want to shine in its natural glory throughout the first communion ceremony. This can be a struggle to combine your wishes and budget with your’s and your daughter’s taste. It is difficult but it can be a great bonding experience. This will create a sense of tradition and making a day of it can be an exciting event for the two of you to experience. Allowing your daughter some choices will make her excited to wear her dress on this important day, and maybe it will even get passed down to her little girl for her first communion. The most popular styles for first communion dresses are typically A-line, ball gown or simple sheath dresses. Having an idea in mind of how traditional or modern your girl’s dress should be is an essential decision as well. Here at Papilio, we have from simple to more extravagant styles to help you find the communion dress of your little girl’s dreams! Style #K7005: This elegant cup sleeved ball gown is a perfect first communion dress! It features a lace bodice and handmade floral décor which will let your daughter feel like a princess on her special day. With the option of coming in light pink, a less traditional, more fashionable look can be achieved. Style #K7006: Another beautiful option is this lace tiered A-line dress with cap sleeves and a high neck. It definitely looks more traditional and vintage inspired. Paired with the simple pink belt, this communion gown is timeless, allowing you to save it for generations to come. Style #K6006: Your little angel will shine in this organza layered gown with such a unique lace décor and a lilac belt around the waistline. Match it will an elegant cardigan or bolero and she is 100% first communion ready. The ruffles create a sense of playfulness while creating a classy look. 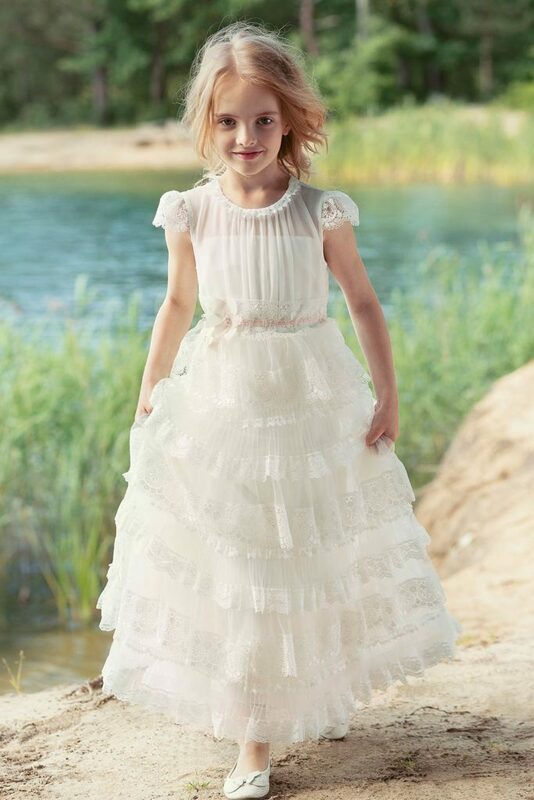 Style #K6003: It is a traditional first communion dress. This gown has a lace top with three quarter length sleeves and a tulle ball gown skirt. The perfect tea length choice, your daughter will look great on this memorable day. No need for a bolero or cardigan, this dress is simply beautiful and comfortable. Check more styles of first communion dresses here and get inspired!